Oblivion is a group of Courtiers from all corners of Tyria who follow the unconventional Duke Marrow. To gather the burnouts and the strays, and to reforge those who have been broken by the failings of previous Courts. Considered a last stop for the most jaded followers of the Nightmare, Oblivion is grooming the wolves and collecting the sheep. They aren't above joyriding through Caledon Forest and snatching fresh converts nor are they shy about engaging in direct genocide against any who threaten their ambitions. Through a careful balance of rank, education, respect, and innovation, the Court seeks to conduct itself with terrifying order despite the rowdy nature of its denizens. The Court's territory is an arid desert hollow on the fringes of Maguuma framed on all sides by jagged outcroppings of ancient sandstone. Accessible by a series of confusing tunnels from the surrounding jungles, the oasis, called Nightingale Valley, hides a lush underbelly of verdant greenery and clean water. Peppered throughout the winding cliffs and secluded lagoons are the workshops, barracks, and personal spaces in which the Oblivionites hone both themselves and their crafts. City-like in its ambitious layout and size, there remain vacancies to be filled in these sand-swept halls. The Valley is in a constant state of renovation and reinvention, filled with the scars of past confrontations and the stitches of projects in progress. In a quiet corner of this convoluted expanse, etching can occasionally be heard as names are chiseled into stone. The Court crafts and maintains memorials here, both to the fallen and to the victories for which they fell. Returning from a series of vengeful skirmishes in the vast deserts of Elona, the Court has strengthened its alliance with the Court of Entopy, gained new assets, and reconnected with old friends. 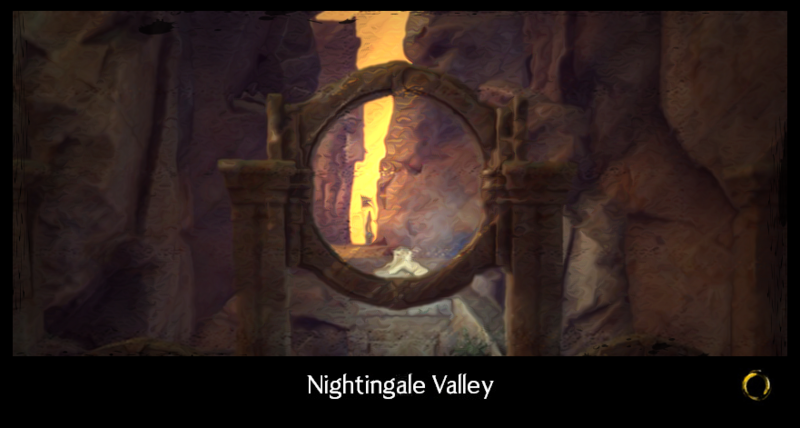 Recently, a pair of 'Sylvari Gates' have been constructed between the jungles of Maguuma and the Entropic outpost in Vabbi. Efforts are underway to stabilize its performance, but the road between the portals remains rocky. Meanwhile, at home, new challenges await as Duke Marrow unveils a plan to purge Inquest from Auric Basin and eventually return to the desert, where the Court will have a second chance to avenge those killed in the mysterious Awakened fortress known only as The Shallow Vein. For now, Oblivion bides its time. It's easiest to apply with a character who is already a Courtier, but we are willing to help people convert. Additionally, the Court does make allies (we even have a guild rank for it! ), so if your character seems like they'd engage in a business arrangement with Oblivion for a long term or if they're sympathetic to the Nightmare in any way, feel free to apply and tell us what you have in mind. ATTN: Bear in mind that only Sylvari can become full members of the Court. Haven't I see you guys before? You sure have! Roughly two years ago, we were serving Duchess Siofrha, but she has since turned things over to Duke Marrow. Recently, the leadership has switched places, hence the fresh thread. Do you play nice with other guilds? Yes! Currently, Oblivion has an in-character truce with The Pale Court [pale] and The Court of Thistle [twc]; we also have a strong alliance with the Court of Entropy [entr], who occasionally joins forces with us for multi-guild RP events and storylines. How about good guy guilds? Yeah, yeah, all right, fine, we'll play with heroes too. Just keep your germs on your side of Tyria! Oblivion may be open to a casual rivalry or outright friction with another group; send us a message if you have something in mind.